This treatment is used when diabetes control is not sufficient with conventional treatments, as is often the case. We conducted a set of studies to assess the effect of the tea Delal a kar. This was the first research project undertaken by PAIR (the Pacific Academic Institute of Research) in Palau. PAIR was established to allow young researchers from the rather isolated islands to work in and for their country, especially in managing and protecting its natural resources. Following an agreement between PAIR, the University of Geneva and the Swiss Federal Institute of Technology in Zurich, these two Swiss institutions are taking part in the research projects in Palau. In Haiti, Antenna joined the Haiti Cosmos Foundation 10 years ago, founded by a Haitian who shares his life between Geneva and Haiti. 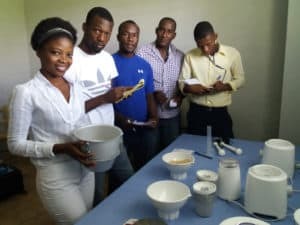 This collaboration led to the installation on the Central Haitian Plateau near Hinche of a plant-based syrup production laboratory, as well as guidelines to the use of local plants that have been scientifically validated. These syrups are delivered to patients at very low cost through the 28 dispensaries set up by the Cosmos Foundation on the Central Plateau. In 2017, the Laboratory obtained the approval of the local authorities for the manufacture of its syrups and thus wanted to extend the offer with the production of herbal capsules scientifically validated. Thus, Antenna’s collaborator went on site to help start up a capsule production unit and to participate in the development of Good Manufacturing Practices and Quality Control adapted to local conditions. 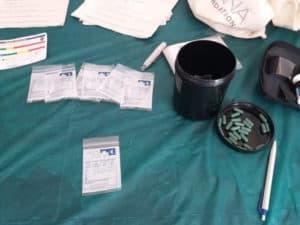 Thus the local population can buy capsules instead of syrups, which has the advantage of not containing sugar (important for diabetics and less risk of cavities) and to keep longer. The capsules currently produced can treat diarrhea and cholera, diabetes, bronchitis and soon hypertension. Traditional local medicines in the republic of Palau and non-communicable diseases (NCD), signs of effectiveness. Graz B, Kitalong C, Yano V., J Ethnopharmacol. 2015 Feb 23; 161:233-7. “DAK”, a traditional decoction in Palau, as adjuvant for patients with insufficient control of diabetes mellitus type II. Kitalong C, Nogueira RC, Benichou J, Yano V, Espangel V, Houriet J, Rudigier C, Graz B. J Ethnopharmacol. 2017 Jun 9;205:116-122.